Gujarat Energy Transmission Corporation Ltd. (GETCO) has published a Advertisement for Trainee Junior Programmer Posts 2016. 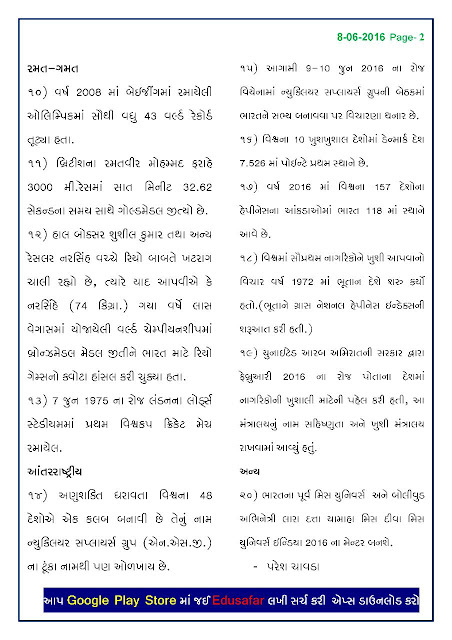 Gujarat Energy Transmission Corporation Ltd. (GETCO) has published a Advertisement for below mentioned Posts 2016. Other details like age limit, educational qualification, selection process, application fee and how to apply are given below. B.E. I B. Tech (Computer Science I Electronic & Communication I BE (IT) or equivalent or MCA Degree of 03 years course obtained after graduation with minimum 60% marks for UR candidates and 55% for ST/SEBC candidates Aggregate of 7th and 8th Semester or final year for MCA, First Trial without ATKT - Passed examination in First attempt from Govt. Recognized university in full time regular course. Age Limit : 35 years for UR Category Candidates. 40 years for ST / SEBC candidates. Upper age limit including all applicable Relaxations is 40 years only. (downloaded after registration) in the branches of State bank of India only. UR/SEBC : 500/- + 60/- Bank Charges. SC/ST : 250/- + 60/- Bank Charges. 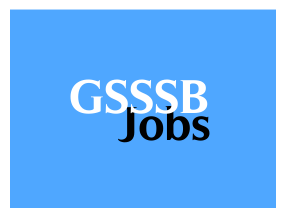 How to Apply : Interested Candidates may Apply Online Through official Website http://www.getco.co.in. 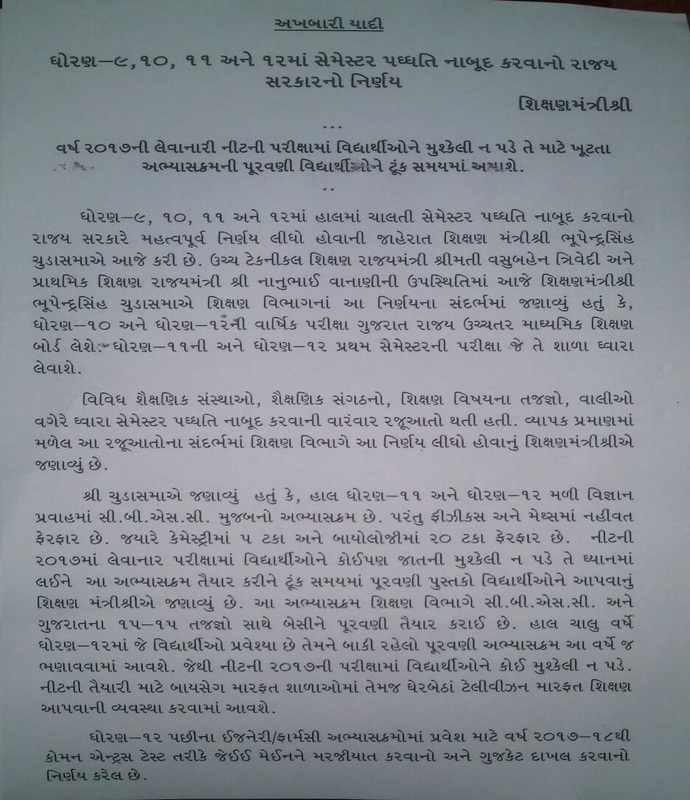 then must send their printout of the application form along with the certified copies of the following documents to the Deputy General Manager & Head of Department (HR), HR Department, Gujarat Energy Transmission Corporate Ltd., Corporate office, Sardar Patel Vidyut Bhavan, 9th Floor, Race course, Vadodara 390007 on or before 07.07.16 by RPAD or Speed post super scribing the envelop as "Application for the Post of Trainee Jr. Programmer. MGVCL Has Published Vidyut Sahayak (Electrical Asstt.) Provisional Result. 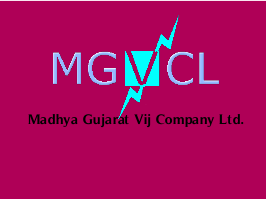 Madhya Gujarat Vij Company Ltd (MGVCL) has published Provisional result of candidates who had appeared in selection process conducted on 17-04-2016 for selection to the post of Vidyut sahayak (Electrical Assistant). The candidates were allowed to appear in the selection process on basis of the information available to this office i.e. without verification of their original testimonials. Therefore their selection shall be considered subject to verification of original testimonials. This is Result of the selection process in order of merit only and not the Selection List. CURRENT AFFAIRS DATE :- 08/06/2016 By EDUSAFAR. 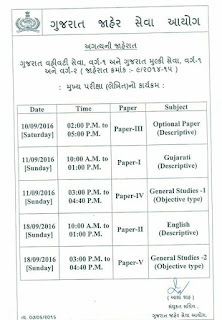 GPSC CLASS 1-2 MAIN EXAM TIME TABLE. DIWALI MA SUDHI MA RS. 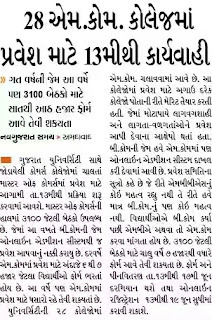 100 MA ONE YEAR INTEERNET AAPVANI TAIYARI:- VIRTUAL NETWORK OPERATOR NI KAMAL. MK Bhavnagar University B.Com Sem-6 Result 2016. 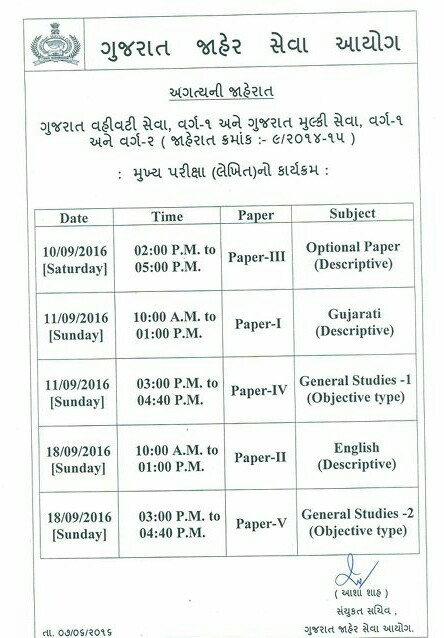 STD.11-12 SCIENCE MA SEMESTER SYSTEM BANDH :- NEET GUJARATI MEDIUM MA J LEVASHE :- NITIN PATEL NI JAHERAT. 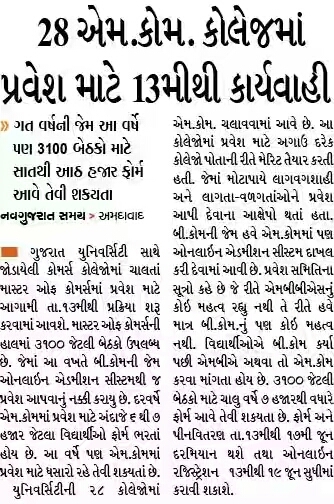 NEET GUJARATI MA,SCIENCE SHIKSHAKO NI MANG VADHASHE. 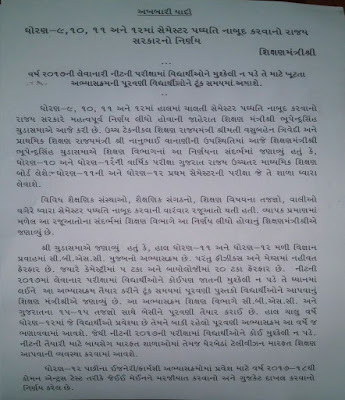 Gujarat Educational News Updates , India news,World News on 08-06-2016. 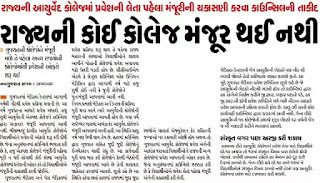 Dear visitor, Here are important Educational news of the Date 08-06-2016 .These all images are taken from Gujarat Various Popular Newspapers, like.Navgujarat Samay,Akila,Sandesh,Divya Bhaskar As per these images you are Know Very Useful Educational News and Gujarat Current news. 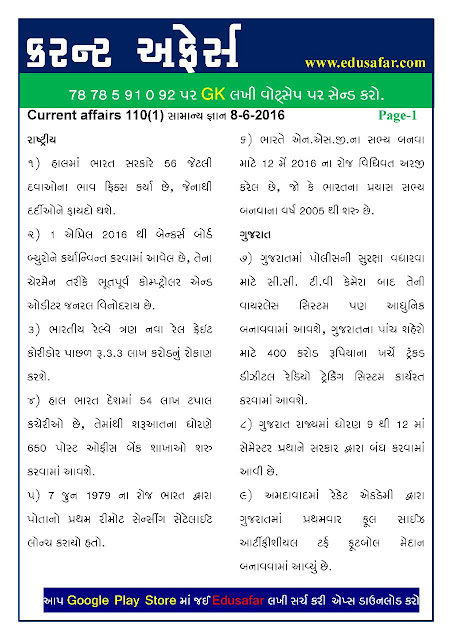 Read Latest Educational News of date 08th june 2016 by Aapnu Gujarat And Also Get Latest Jobs Notification On Our site. now you can get latest educational news given below. 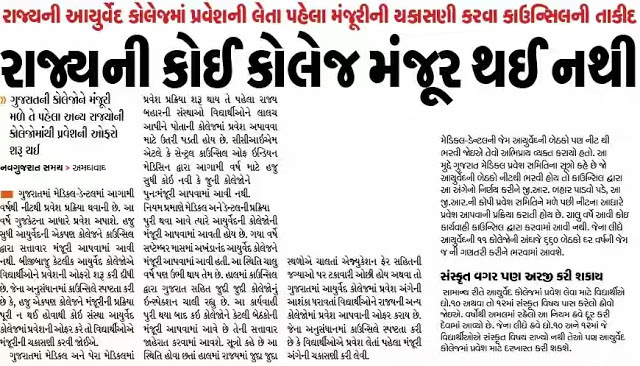 All Gujarati Newspaper Read Krne Ke Liye Yha Click Kre.